Choosing a Domain Name for Your Website - Brigitte Belsky ~Helping You Create Your Laptop Lifestyle! Choosing a domain name for your website is EXCITING. It’s part of your address to lead anyone to your digital space – Your Website! At the same time it can feel daunting & overwhelming. What is the best name to use? So many thoughts, so many ideas? It’s an important part of your online business. You’ve got to love it as it will be your websites’ long term brand & you will be known by it. Domain names can have hyphens &/or numbers, however these are not recommended. People generally would not remember if there were any hyphens or indeed where they are placed. An example of a hyphenated domain name would be ‘my-online-business.org’. With numbers they wouldn’t remember if they were spelt out or numerical, eg: ‘studiofortythreehairstylist.com’ / ‘studio43hairstylist.com’. 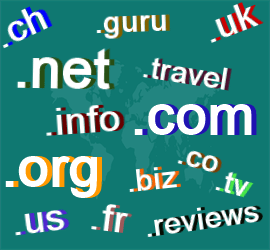 Nowadays there are 100’s of domain extensions to choose from, the most familiar ones being ‘.com’, ‘.org’, or ‘.net’. Other examples include country specific such as ‘.us’, ‘.uk’, ‘.fr’; more recently generic ones such as ‘.guru’, ‘.travel’, ‘.reviews’. Dot com is still highly recommended as your first option, then dot org or dot net. Back in the day keyword specific domain names was the way to go to get ranked high by search engines. Search Engines got wise to this & found far too many of these websites were low on content value, so now it is no longer the case. There is no advantage to having a keyword specific domain name over a brandable domain name. The bottom line is search engines will associate your domain name with the keywords used in the content of your website. So it’s up to you how you name your domain. There is no hard & fast rule, just things to take into consideration. Simple and the shorter the better. Keeping your domain name simple and short is easier for your audience to remember, also preferably something that rolls off the tongue easily. Choosing a domain name that later you look at & realise it has another interpretation, one that is not appropriate can be devastating. When you take into consideration the under-mentioned points, it’s easy to see how a domain name can unintentionally have a double meaning. To avoid choosing a domain name that could unintentionally be inappropriate don’t register it straight away. Walk away from it, then come back and look at it with a clear mind & fresh eyes. Ask those around you to tell you what they see, get feedback. Sometimes it’s inevitable when using a particular domain extension; it can add a whole new meaning. Also it’s unfortunate that some family names, foreign names/words or a word that describes what you do have within them hidden words. In this case you need to weigh up how it will affect your business and if it’s worth going ahead with. To see what I mean take a look at some domain names chosen intentionally or unintentionally for their double meaning in English. Some will give you a chuckle others may make your stomach turn. What do you see at first? Of course once you go to the website you generally get the intention. Not all the above domain names are active today but they were at some point & some are redirected to a new domain name. In the main we’re told not to take too much time choosing our domain name, however it’s worth checking that it doesn’t contain an unintentional double meaning that could harm your business. Have you seen a domain name that should be on this list? Let us know in the comments below. Does your domain name have an unintentional double meaning? To your abundance & dream laptop lifestyle! ← What is a Niche? & How to Find Your Niche!